Known for its one-of-a-kind slots and video poker games, WinADay.com has introduced its own unique version of another casino classic, Keno. Keno is a straightforward, easy to play game of lucky numbers. The excitement builds in this amazing new game from the moment the dramatic, futuristic sound track starts to play on the multi-ticket game until the 20 winning numbers are dramatically displayed. “For a long time, like our other site – Slotland.com – WinADay.com was all slot machines and video poker games. This is the second new casino game that we’ve added to WinADay,” said casino manager Michael Hilary. Many of our players play only slots but many have told us over the years that they also enjoy other casino games like Roulette and Keno. This is the second game at WinADay.com that’s not a slot machine or video poker game. Roulette 5, which was introduced in April, combines slots and roulette. Keno has come a long way since the ancient Chinese used pigeons to deliver Keno numbers to outlying villages. WinADay.com’s new online Keno is a sophisticated high tech game that’s simple to play. Players can pick their own 15 numbers or use the Quick Pick feature to let the game select for them. 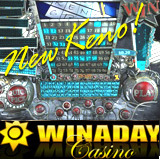 WinADay Keno players can play up to 7 tickets, or selections of numbers, per game. More numbers to watch means more fun. Any way it’s played, playing Kino is as simple as waiting for those numbers to come up. For players that are new to Keno and want to get some practice before betting real money, WinADay Keno can be played in free mode or for real money. WinADay has had to expand its casino games room to accommodate all of the new games that have been added this year. With the addition of the new Tropical Treat slot machine last month and now the new Keno, there are now 16 one-of-a-kind games at WinADay. There are nine slot machines, four video poker games and WinADay’s unique versions of two classic casino games. All games are instant-play so there’s no downloading or installation required. All of the online slot machines at WinADay.com are tied to a common progressive jackpot which is currently over $65,000. Just last month, a film student won $200,859, WinADay’s second largest progressive jackpot ever.